I was born in London, England, and came to Australia with my husband, where we settled near Melbourne. I already had 3 sisters living here, so didn't pine for my homeland. I admit I did miss the green and glorious countryside, but soon found compensations in the wide open and amazing country that has been my home for many years now. Born into a large, loving, family (I was the youngest) I never knew what it was like to be lonely or alone growing up. I was surrounded by avid readers, and well remember my first book--a picture-book copy of Alice in Wonderland. I can also remember boring my mother every morning as I retold the dreams that filled my sleep the night before. Is it any wonder I became a writer? I still dream every night and some of those dreams have translated into ideas for my books. Dreaming is a good pastime for an author. I began writing many years ago, but it wasn't until I retired from the fashion industry that I had the time to write full time. I can't imagine life without writing and books now. Although my published works cross sub-genres, romance is always at the crux of my stories. I love a happy ending. There's a surfeit of tragedy in the world today so I try not to dwell on the seedier side of life in my books. That's not to say that I don't sometimes shed a tear or two as my heroine endures heartache along the road to that happy ending--and I know by my reader's comments that most cry and laugh along with her. I just love the research entailed in writing historicals and my other great passion, time-travels. I find research fascinating. You learn so much in the course of searching for information. Horses and dogs often feature in my books. 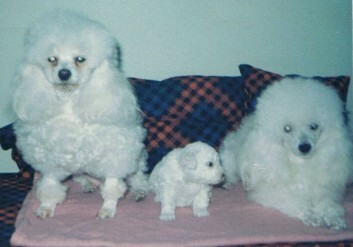 My husband bought me a toy poodle soon after our wedding and I bred from her. We brought our two poodles to Australia with us. Since then I've had a succession of dogs and a cat or two and can't imagine life without a dog in the house. I've owned a few horses. I support various wildlife groups and care sincerely about the animals of this world, big and small.